The reason is simpler than you probably anticipated: Those motorcycle enthusiasts do not take their drive chains for granted and they value their fingers. Man and machine can be friends. But you really do not need to drink an ounce of engine oil, or pour a cup of instant noodles into your vehicle's fuel tank to revitalise that sweet relationship. 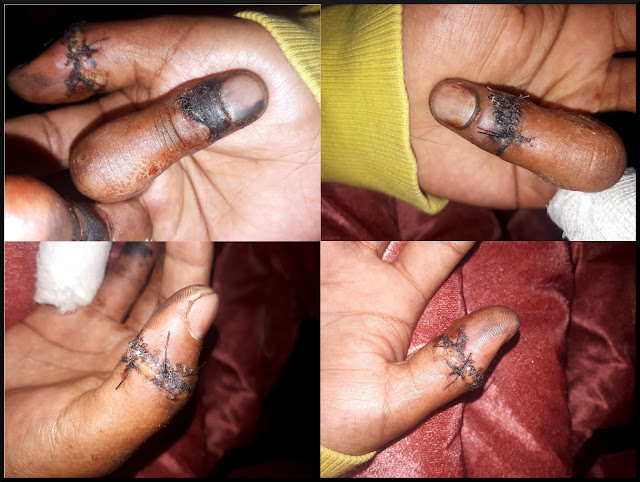 About two weeks back, one of my motorcyclist friends got his fingers badly injured while cleaning his bike chain. He is an experienced rider who often ventures out for solo motorcycle tours with his gorgeous yellow Royal Enfield Continental GT. There is no doubt about his technical skills related to the maintenance of his machine. So where did he go wrong? It's a pity that over-familiarity, overconfidence and impatience join hands at times to overpower our good wits. My friend was cleaning a moving chain. It is not the first time he was cleaning a chain in motion. It is just that, fortune didn't favour the gutsy this time. Four of his fingers took the bad blow. There is a silver lining to every murky cloud. His fingers could even get chopped off. The mishap was limited to multiple cut injuries and bruises. Lucky fellow didn't end up losing his digits. He got timely emergency medical treatment in a nearby clinic. 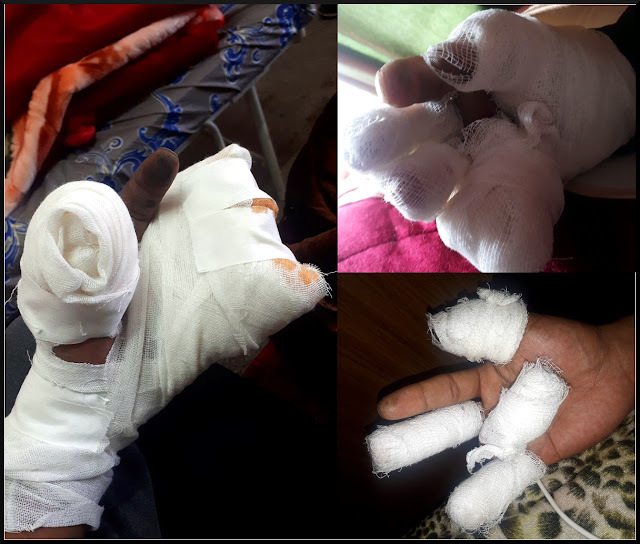 Cut injuries were dressed, sutured and bandaged. These photos had been taken on the tenth day of his recovery period. Hope you are smart enough to visualise the gravity of his miscalculation. So, are you also in the habit of cleaning a moving drive chain? You do not have to answer me. When I shared this story in various motorcycling and travelling groups I came to know that such accidents are not uncommon among motorcycle lovers. Few community members shared photos which looked scarier and much more heart breaking. Yes, many riders till date have lost skin, blood, flesh and bone while babysitting a moving motorcycle chain. Take it as their unwanted bravado or the inability to live with practicality. Either way, they ended up paying a ridiculously high price for their imprudence. You can afford to lose time and money, but not fingers. Get it very straight, you are no starfish. Few motorcyclists had commented negatively about the injured rider. For a moment I was upset with their apparent lack of empathy. Later I realised that they were angry. Their anger was born out of the frustration. Most of them are tired of warning their fellow riders not to work on a moving motorbike chain. Still such mistakes are being repeated. 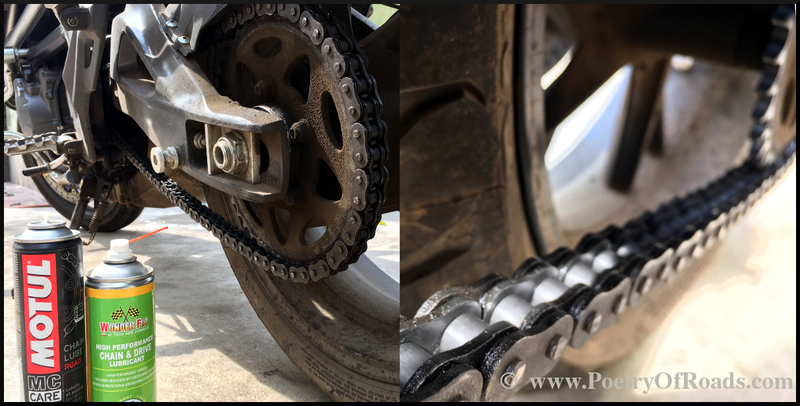 Your motorcycle drive chain may require more frequent maintenance than advised in the owner's manual. This depends on your riding style, road conditions, lubricant quality and the season. Unlike me, if you do not pet the OCD of touching the sticky chain every time you park your beauty into the garage it is perfectly okay to check the chain every 500-600 kilometres. Riding with the chain in poor condition or improperly adjusted can lead to an accident. So, inspect, adjust and maintain the chain carefully before every long ride. When inspecting the chain, look for any- loose pin, damaged roller, rusted link, missing 'O' ring seal, kinked link, excessive wear or improper chain adjustment. Inspect the sprockets for excessively worn teeth, broken teeth and loose sprocket mounting nuts. If you find any of those it's highly recommended to seek for your mechanic's opinion. Adjust the drive chain slackness to the proper specification. Excessive chain slack could cause the chain to come off the sprockets and result in something totally unwanted. Cleaning and lubricating aspects have already been discussed. My friend committed the blunder of taking his motorcycle chain for granted and he was taught in a harsh way. He needs at least another few weeks of healing before he can sit on the saddle again. So, are you doing it the right way? It is never too late to part with our bad habits. Ponder over it. In the coming week I'll reveal my upcoming riding plan. It'll be over 6,000 kilometres of poetry of roads. See you soon. Oops! That looks pretty bad. Not quite a motorbike enthusiast, but it's a common sense not to take any machine for granted. Pls care yourself. Life is important than anything else. At the point when first beginning, it is quite often better to join a gathering in procedure, or, make a fun, multi day trip, to get involvement. My own experience included learning the technique for a specific voyage dispatch.